I would not consider myself a gamer. I have a Wii, a PlayStation2 and an XBox, but the amount of games that I have played in my lifetime could be listed in this review and not drastically increase the length. 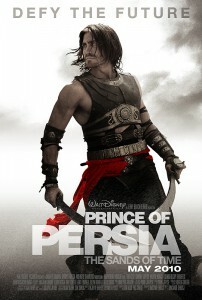 That list does not include any of the Prince of Persia games upon which this film was based. However, I cannot safely say that I am not part of the target audience for this film. I believe that film, being its own entity, should be able to fail or succeed on its own merits. I should not have to have read (or played) the source material in order to enjoy and/or appreciate the film. And while the two friends (both fans of the game) I saw this with were extremely satisfied by what they had seen, the film failed to engage me in any way, which only served to highlight the areas in which I felt the movie failed. Prince of Persia: The Sands of Time follows the story of Prince Dastan (Gyllenhaal). We are told at the beginning of the film that Dastan was not born a Prince, but was an orphan, living on the streets. One day, the King (Ronald Pickup) witnesses young Dastan (William Foster) commit an act of bravery and decides to adopt the boy as one of his own. After leading the charge into the holy city of Alamut, Dastan comes into the possession of a dagger that has the power to turn back time, although he does not know this at first. After being framed for a heinous crime, he must flee the city with the aid of Princess Tamina (Arterton), who was the previous owner of the dagger and is responsible for its safety. Should the dagger fall into the wrong hands, the consequences could be dire. The problems with the film start almost at the beginning of the film. There’s a prologue in which much is told to the audience, as though someone were reading them a story. Thankfully, the voice over narration does not carry through the entire film, but the first ten minutes of the film are spent telling the viewing audience information that could be interwoven into the main story and is, in fact, at some points in the film, repeated. It would have been more interesting to not have known Dastan’s origin when Tamina is taunting him in the desert for having the walk of a Prince, of someone who has been told since birth how important he is. His reply to her taunting would have carried more weight, because we would not have known from the beginning, just how much he had lost at the moment of his betrayal. How he was betrayed, and who betrayed him are two questions I cannot answer in this review. Nor can I openly discuss my largest issue with the film, as it involves the ending and I believe in writing spoiler free reviews. What I can say about this issue is that I had figured out at about the 45 minute mark how the film was going to end, and when it did exactly what I thought it would do, all I could do was shake my head. There was no other way to give the film a “satisfying” ending, and I don’t know if I would have liked the film more if I didn’t see it coming. Sadly, I’m pretty sure if the film had been worse – if the CGI had been horrific, if Gyllenhaal’s accent had fallen in and out, if the cinematography had been horrendous – I might have liked it more. I could have fallen into the “so bad it’s good” category that I thoroughly enjoy. Alas, this is a film that tried to be a good film, that wanted to be a good film, and failed.